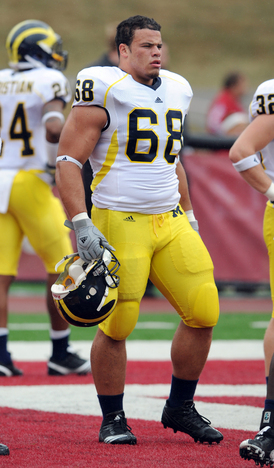 Posted on Sat, Jan 14, 2012 : 11:43 a.m.
Former Michigan football star Mike Martin said he and David Molk have been invited to participate in the NFL Combine. The combine is a week-long showcase for more than 300 of the country's best college players to perform mental and physical tests for NFL personnel. It will be held Feb. 22-28 in Indianapolis. The NFL Draft is April 26-28 in New York. Martin and Molk are training for the combine with former Michigan strength and conditioning coach Mike Barwis, who has set up his own training facility, Barwis Methods, located in Plymouth. Martin, a defensive tackle, is considered Michigan's top NFL prospect. Multiple scouts have told AnnArbor.com he is an early-round prospect. His biggest plus is his strength, and his compact build (he's 6-foot-2) is his most notable weakness. ESPN ranks Martin as the 15th-best defensive tackle prospect. They gush about his strength, speed and intangibles, and list his weaknesses as pass rushing and durability. Molk won the Rimington this year as the nation's best center, and ESPN ranks him as the No. 2 pro prospect at that position. Like Martin, his strength stacks up well with others in this draft class, but his compact size — he's 6-2, 286 pounds — could impact his pro stock. He also is limited by a foot injury he suffered in Michigan's Sugar Bowl win Jan. 3. Kevin Koger, a tight end who is well-liked by pro scouts, was not invited to the combine. Defensive lineman Ryan Van Bergen, offensive lineman Mark Huyge and tight end Steve Watson also will not attend. Each is training with Molk and Martin at Barwis Methods and expected to participate in Michigan's pro day March 15. It will be held on campus at the team's football facility. It is unclear whether receiver Junior Hemingway has been invited to the combine. Sun, Jan 15, 2012 : 2:03 a.m.
Yah- 6'2 is petite by NFL standards. Sun, Jan 15, 2012 : 12:39 a.m.
RVB may not have been invited to the combine, but word out of Valley Ranch is that the Cowboys think well of him. Jerry is saying he'd like to see about getting him in the 3rd or 4th round. Sat, Jan 14, 2012 : 9:58 p.m.
Martin's agility and strength will get him on a roster whether he's drafted or not. His only problem may be that he's a tweener by most NFL standards but he will find some playing-time mostly in nickle packages. Sat, Jan 14, 2012 : 7:08 p.m.
Hey Kyle. how about a trivia contest for a trip to the cobime? Question 1-Day 1-- What is the name of the Al Borges offensive package that is a clear reference to a former MEEEEEEANchigan COACH? Sun, Jan 15, 2012 : 1:12 p.m. The answer is...............Nas-Carr!! named after former COACH CARR!!! Sun, Jan 15, 2012 : 2 a.m. The Lloyd Carr/ John Nevarre rock of Gibraltar package? Sat, Jan 14, 2012 : 6:12 p.m. Very glad to know Mike Barwis is involved. He knows these guys. Seems like that bond was not broken. I wish all them much success.